After the murder of Emperor Pertinax (193), a struggle began for the succession to the throne, the so-called Year of the Five Emperors. 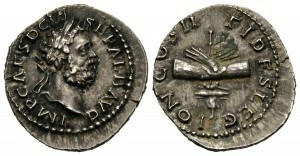 The new self-proclaimed Emperor in Rome, Didius Julianus, had to face the commander of the Pannonian legions, Septimius Severus. Before moving on Rome, Severus made an alliance with the powerful commander of the legions in Britannia, Clodius Albinus, recognizing him as Caesar. 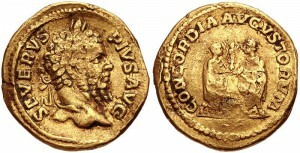 After eliminating Didius that same year and then defeating the governor of Syria in 194, Severus launched a successful campaign in the East in 195. 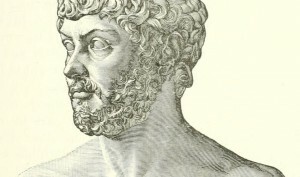 Severus then tried to legitimize his power, connecting himself with Marcus Aurelius, and raising his own son to the rank of Caesar. This last act broke Severus’ alliance with Albinus, who was declared a public enemy by the Senate. In 196, after being hailed as emperor by his troops, Clodius Albinus took three legions from Britannia to Gaul and set up headquarters at Lugdunum. He was joined there by the governor of Hispania Tarraconensis, and by the Legio VII Gemina under his command. But Severus had the powerful Danubian and German legions on his side. To try to minimise this advantage and possibly win their support, Albinus struck first against the German forces. He defeated them, but not decisively enough to challenge their allegiance to Severus. Albinus then considered invading Italy, but Severus had prepared for this by reinforcing the garrisons of the Alpine passes. Not wishing to risk the losses or the delay that forcing the passes would cause, Albinus was deterred. In the winter of 196–197, Severus gathered his forces along the Danube and marched into Gaul, where, to his surprise, he found that Albinus’ forces were about the same strength as his own. The two armies first clashed at Tinurtium, where Severus had the better day but was unable to obtain the decisive victory he needed. Albinus’ army fell back to Lugdunum; Severus followed, and on 19 February 197, the massive and ultimately decisive battle finally commenced. The exact details are as vague as the exact numbers involved. However, we do know both sides were roughly evenly matched and it was therefore a bloody and drawn-out affair lasting over two days (it was rare for battles of this time to last longer than a few hours). The tide shifted many times during the course of the battle, with the outcome hanging in the balance. It seems Severus had the edge in cavalry, which swung the battle in his favour for the final time. Exhausted and wounded, Albinus’ army was crushed. The exact cause of Albinus’ death is unclear. He fled into Lugdunum where he either, in the Roman tradition, “ran upon his sword” after finding all escape routes impossible, or he was finished off by an assassin’s blade. Severus had Albinus’ body stripped and beheaded. He rode over the headless corpse with his horse in front of his victorious troops. The head he sent back to Rome as a warning along with the heads of Albinus’ family. In Lugdunum itself, Septimius remodeled the Imperial cult sanctuary to celebrate his dominance and humiliate Albinus’ provincial supporters.